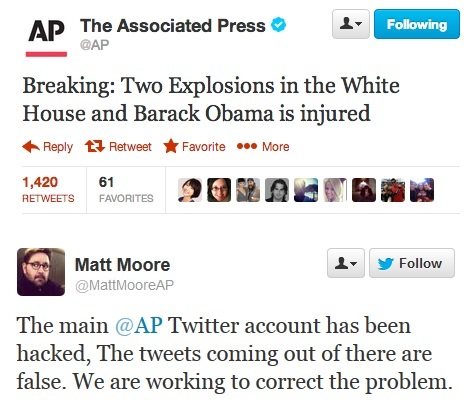 The Associated Press Twitter account has been hacked,and posted a bogus post about explosions at the White House and Barack Obama is injured. Within a few minutes, Twitter suspended the account, and Julie Pace, the chief White House correspondent for The A.P., announced at a White House briefing that the account had been hacked. "The president is fine," spokesman Jay Carney said. "I was just with him." AP said later: "The @AP twitter account has been hacked. The tweet about an attack at the White House is false." The Syrian Electronic Army claimed responsibility, tweeting out: "Ops! @AP get owned by Syrian Electronic Army! #SEA #Syria #ByeByeObama." Last year, it took over Twitter and Facebook accounts of the Al Arabiya news channel to spread fake news of a coup and explosion in Qatar, which sides with the Syrian rebels. Shortly after the account was suspended, Mike Baker, a reporter for the news organization, posted a message saying that the attack may have originated with a spear-phishing campaign, in which attackers send a cleverly disguised e-mail from a friend, or work contact, that contains a malicious link or attachment. The incident took place eight days after the Boston Marathon bombings. The wire service said its mobile Twitter account was also broken into, and all of its accounts have been shut down.